Michael Scott, "and then he tried to swallow the world"
Come summer, it’s common practice for dealers to slap together a group exhibition or, more occasionally, to give a lesser-known artist a break. But a few prefer to embrace the seasonal weather by filling their spaces with sunny work. 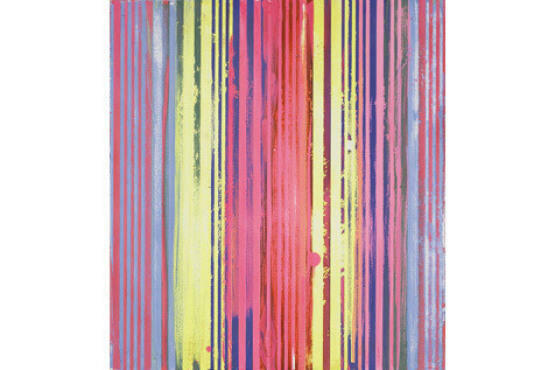 This year, Gering & Lpez falls into the latter camp, hosting a selection of effervescent striped paintings by Michael Scott. Marking the end of a decade-long absence from the New York scene, Scott’s comeback show follows up a series that made aggressive use of dizzying optical effects with one that adopts a more easygoing approach. While persisting with a systematic process, the artist here also embraces the innate imprecision of working by hand, and allows the peculiarities of his medium (enamel) and supports (square wood and aluminum panels) to exercise their own subtle influence on the results.